No one knows the Macedon Wine Region like we do; it’s our home base! On our daily Macedon Ranges wine tour, you will visit 4 or 5 of the Macedon wine region’s finest wineries and vineyards. Macedon Ranges winery tours may include Hanging Rock Winery, Glen Erin Vineyard Retreat, Granite Hills, Gisborne Peak Winery, Curly Flat Vineyard, Morgan Field, Farrawell, Riddells Creek Winery, Cobaw Ridge, Rowanston on the Track, Longview Creek and Midhill Vineyard. The beauty of a day out in the Macedon Ranges Wine Region with Wine Tours Victoria is that you lead the way. We will work with you to design a day that suits you. Wineries of choice, key locations – it’s all up to you. Let us know what you want from your day and we’ll use our expertise to make it happen. Your tour begins with you being picked up from your accommodation within the Melbourne CBD or local surrounding area and then you can leave the rest to us. Wine Tours Victoria works hard to create a memorable day of great experiences for you and your companions in one of Victoria’s famed wine regions. Are you interested in seeing other aspects of the Macedon wine region? We endeavour to include areas of interest in your personal Macedon Ranges wine tour. Wine Tours Victoria makes sure your winery tour to Macedon Ranges is special, comfortable and memorable. The popular tourist attraction of Hanging Rock. 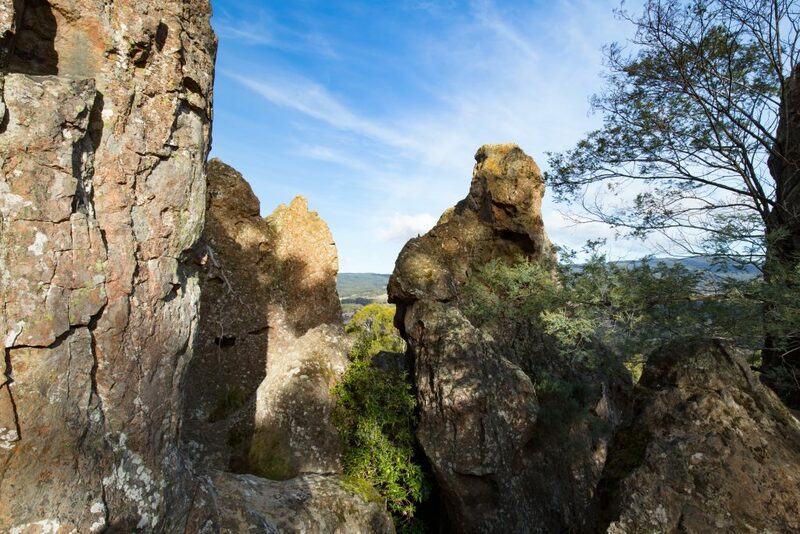 A volcanic group of rocks atop a hill in the Macedon ranges. A common stop for our morning tea. 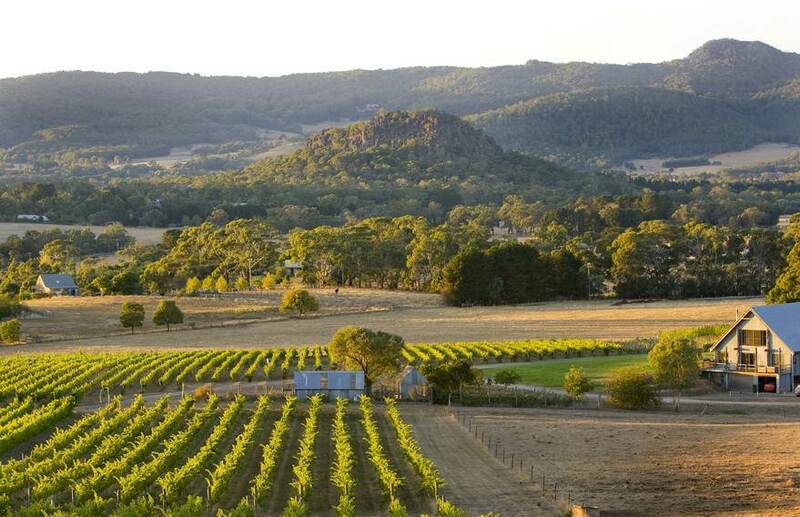 During the tour you will get to experience a range of the other boutique wineries that surround the beautiful macedon ranges. We are regular guests at all of the region’s top wineries, including Hanging Rock Winery, Glen Erin Vineyard Retreat, Granite Hills, Gisborne Peak Winery, Curly Flat Vineyard, Paramoor, Cloud 9 Farm, and Cope-Williams. A fantastic lunch made with local produce is provided on the tour and is sure to be memorable. Family and I had a wonderful time visiting wineries in the beautiful Macedon ranges outside of Melbourne. Our driver and tour guide Helena was superb and a fountain of information. Had a morning stop at the very pretty Hanging Rock Park where we had great coffee and cake picnic style. Stopped mid-day for a wonderful lunch and had the great fortune to meet the owner of Wine Tours Victoria Trevor who was also guiding another tour and having lunch with them also. Told Trevor my only regret was not having enough vacation time left in Melbourne to do another regional wine tour with him. Trevor your company is great. We were all treated like family members rather than mere numbers. Highly recommend this company. We booked a wine tour of the Macedon Ranges. We chose this area because we wanted a laid back, leisurely tasting experience. We got exactly that. Trevor picked us up right on time at our hotel in downtown Melbourne. It was very nice in that it was just our group (3 people) in the van. We stopped in the shadow of Hanging Rock for a quick coffee break. We were amazed and delighted when Trevor pulled out the tablecloth, French press and homemade fruit cake from the back of the van. My daughter was delighted that she finally saw a kangaroo. We then visited a total of 3 wineries: Cope Williams, Hanging Rock, and Granite Hills. All had exceptional wines. Trevor is extremely knowledgeable about wine and the history of the area. The scenery is spectacular so the drives between wineries went by very quickly. Trevor arranged for a pub lunch for us which was delicious. All in all it was a fantastic day and well worth it. Best 2 wine tours I have experienced in Victoria!!. Visited the Bellarine Peninsula & Macedon Ranges. Food and wine were excellent and our drivers, Trevor and John were a wealth of local knowledge and the scenery was just stunning. Be sure to take your camera and get ready for an amazing day out. Oh, and the home made goodies for morning tea are just divine. Thanks guys for a wonderful experience. Love the benefits of small tour groups. We visited some wonderful wineries, tucked away in the Macedon Ranges. Out guide was passionate and experienced, he shared stories about the places we visited and made us all very comfortable.. The wine and food was if high quality and we thoroughly enjoyed our day out. The bus pick up drop off service was extremely handy allowing our whole group to participate in the day.